We’ve all heard that the world is flat (thanks Friedman) and we all know that American manufacturing rarely takes place America anymore. What we often don’t talk about is what life is like in those places left behind. While this book claims to be about one man who saves a town (which he kind of does, spoiler), it’s really about what happened to the town when all the other factories left. 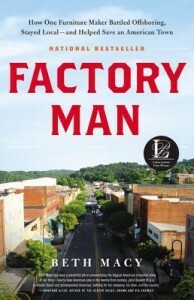 Factory Man is therefore a chilling portrait of 21st century America, one where people who have worked hard for their entire lives are summarily unemployed in favor of workers in China or Taiwan or the like. Macy interviews them as she tells her story of John Bassett III and, to be honest, their stories are the ones that stuck with me. If one is focusing entirely on JBIII (as she calls Bassett), then it’s a fascinating portrait of one guys’ determination to not completely destroy his family’s legacy (Bassett is a furniture manufacturing behemoth, the IKEA of America as it were) while still keeping the business afloat. For that reason, it’s worth reading. It’s also worth reading for the way Macy tells the human stories. I was captivated by her writing – I’ve never run across her work before – and felt myself truly feeling for the people stuck between all the rocks and all the hard places. The geopolitical machinations were made without these people in mind, but they’re the ones paying the highest prices for them. This book should be mandatory reading in all business, economic, political science or world affairs classes. Titans of industry should have it on their shelves, to remind them that there are so many sides to all decisions and stories and to take care with their workers. I am thankful for Bassett and so many others like him who strive to keep American manufacturing in America, but I also know it’s not easy. I read this with several cups of coffee over several days – it’s an easy read but a long one. Settle in for sure. Looking for a new dining room set? Look no further than Bassett. Globalization and Its Discontents is one of the preeminent anti-globalization books and balances The World is Flat really well. That Used to Be Us: a book by Friedman and Mandlebaum about how America is falling behind in the world it created. Posits interesting ideas that parallel some of the things Bassett did. I received a copy of this book from the publishers via NetGalley in exchange for a fair and honest review. Thanks! Business, Coffee, Leadership, Non-Fiction, Teachable, U.S.